12.15.08 OSP MAKES CHANGES IN BACKGROUND CHECK PROCESS. Since early 2011, we have received a spike in complaints about delays and denials once again.So the following information is out of date. Although OSP had improved their performance doing background checks, we are back where we started in terms of slow service and unjustified delays. A bill we drafted in the 2011 legislative session which would have turned over background checks to the NICS system died in the Ways and Means Committee after state workers from the ID unit of OSP testified that if NICS handled the background checks they might lose their jobs and Oregon’s economy would collapse. The Oregon legislature caved. 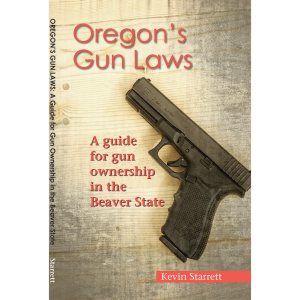 For several years, OFF has received a large volume of correspondence from Oregonians who had been delayed for firearms purchases for reasons the buyers often could not understand. It has always been OFF’s position that background checks and requests for permission to exercise a right turn that right into a privilege, but until we can do away with these unconstitutional burdens we believe it is important to prevent as many obstacles to gun possession as possible. At our request, the Oregon State Police ID unit agreed to review their polices and procedures concerning background checks. OFF had several meetings with the OSP ID Unit and we are pleased to be able to report substantial progress and cooperation from the Oregon State Police. The new manual reflects this and should be helpful for dealers who were unsure whether they could, in fact, deliver a firearm before an “approval” was issued. If you are experiencing delays because a dealer won’t release a firearm without an approval, you can take them a copy of this letter from the State Police clearly saying the transfer MAY take place. They are not required to release it, but if they refuse you should find a smarter dealer. The State Police will be sending a letter out to all Oregon gun dealers with information including new phone numbers that buyers can use to request information about delays and denials. The State Police have informed us that they plan to have an improved response to those inquiries. OSP will also be providing dealers with handouts to give to customers with contact info in the event of a delay or denial. For buyers who have questions about delays and denials, the new number to request information is 503-373-1808 EX 327. The State Police have promised to respond to questions about delays and denials promptly. OSP also plans to post all this information and current documents on their website. 12.14.08 OREGON COURT OF APPEALS DEALS MAJOR BLOW TO GUN RIGHTS. 01.06.09 Josephine County Sheriff To Meet With Gun Owners.